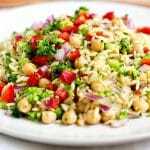 This orzo pasta salad with broccoli, bell pepper, red onion, and chickpeas is a great summer side dish. It’s tossed in a lemony vinaigrette making it a fresh and light companion for grilled steak, chicken, or seafood. Make it ahead to let all the flavors marry together and serve it cold or at room temperature. Lately, I’ve been trying (emphasis on the word trying!) to eat a little lighter, so when the nice folks at Harper Collins sent me a copy of Lose Weight by Eating by Audrey Johns the timing couldn’t have been better. 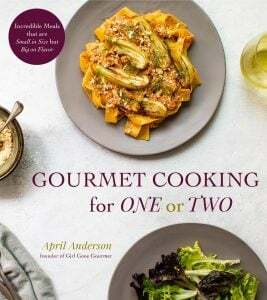 The book is a collection of recipes for guilt-free comfort food. Um, yes, please. 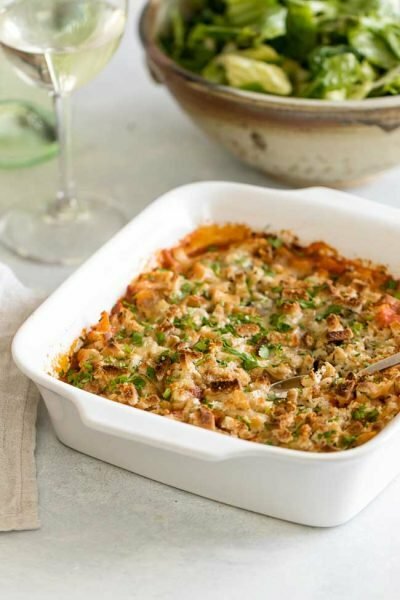 Eat lighter, but still make all my favorite sorts of dishes like pasta, cheese, and bread? Sign me up. Audrey Johns is the blogger behind the website Lose Weight by Eating and her eating plans and her food and cooking philosophy has won her legions of loyal fans. After reading her book, I can understand why. Her style of cooking is approachable, simple and, according to the call-out on the front of her book, her eating plan will help you lose 15 pounds in 30 days. That’s quite a claim. The book has hundreds of recipes with nutritional information that use pretty simple ingredients, although Johns calls out in the introduction that she shops exclusively at Trader Joe’s, which made me pause. I’m more of a regular grocery store gal mostly because the Trader Joe’s near us is always so freakin’ busy. I hate crowded stores and parking lots. Luckily, the Trader Joe thing doesn’t matter – most of the recipes call for things found at most grocery stores. Her meatball recipe concerned me a bit. The recipe is so simple I thought there was no way it would turn out what I imagine a meatball to be – a juicy, savory, ball of tender beef. The recipe calls for ground turkey, with a few basics to help form the balls, and you just plop them in a basic sauce in a slow cooker where they simmer all day long. And the result? 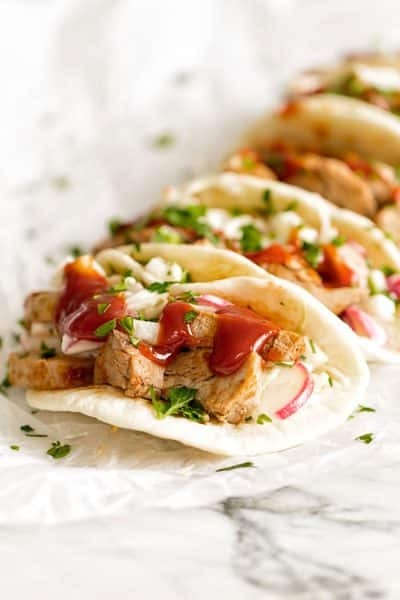 I had to eat crow on this one because they were surprisingly tender and that basic sauce slow-cooked itself into a rich and savory concoction that was way more than the sum of its parts. We had some for dinner with pasta and I ate the leftover meatballs for lunch sans pasta with different veggies on the side. I was intrigued to try more. For people trying to lose weight, dessert is always the first thing to go, but Johns has all sorts of sweet treats that are low in calories. I went with the tiramisu an option that appeared to have all the right stuff to call itself a tiramisu, but in reality fell a little flat for me. Maybe it’s because classic tiramisu is so decadent and rich. Trying to substitute all of the eggs, milk, and mascarpone cheese with mixture of greek yogurt and powdered sugar is sort of like a pizza with a cauliflower crust and no cheese. It just ain’t the same. The final recipe I tried was her Greek pasta salad with tomatoes, cucumber, olives, and feta cheese. Pasta salad can be tricky – you need the right amount of dressing otherwise it can be too overpowering or bland and flavorless. 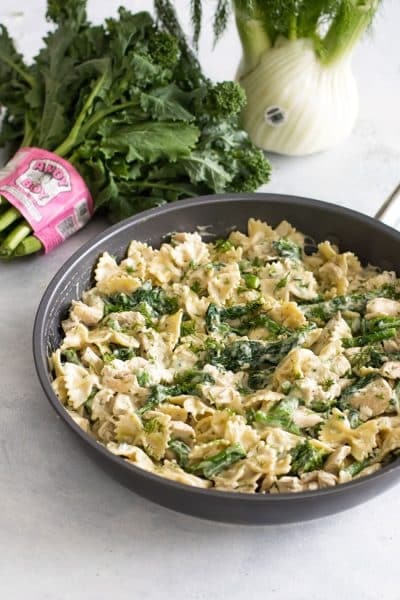 This Greek pasta struck just the right chord – plenty of flavor in the dressing allowing the other ingredients to sing. Only one complaint: like a lot of people I didn’t read the recipe through before making it so when I got everything ready I found in the instructions that the dressing should be made at least 24 hours in advance. Doh! Shame on me, but that sort of info is really helpful in the headnotes before the recipe. Despite the dessert miss, overall I liked this book. I don’t like “diet food” and I plan to reach for it when I need inspiration for lightened-up dishes that use real, unprocessed ingredients. Her story is inspiring – she lost a lot of weight herself – and I can see why she’s attracted so many followers. I’m looking forward to trying more (her breakfast cookies, pizza, and macaroni and cheese recipes on are my list) and she also includes helpful meal plans and tips and tricks for success. 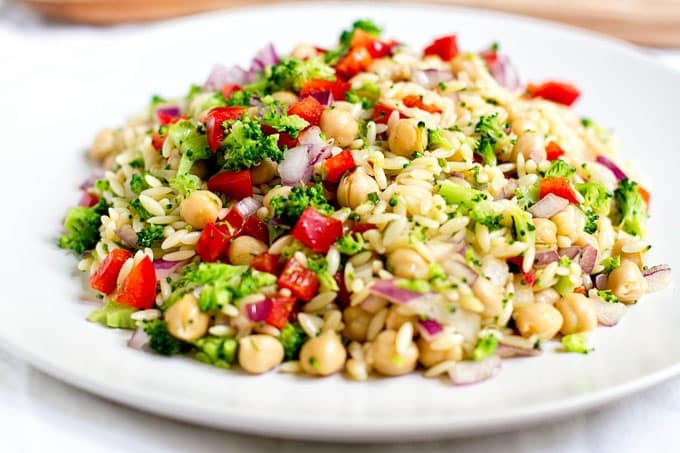 So in the spirit of healthy, light, and dishes fit for a BBQ or potluck, I’m sharing this orzo pasta salad, inspired by the one I made in the book. It’s light and summery – just what we need this time of year. 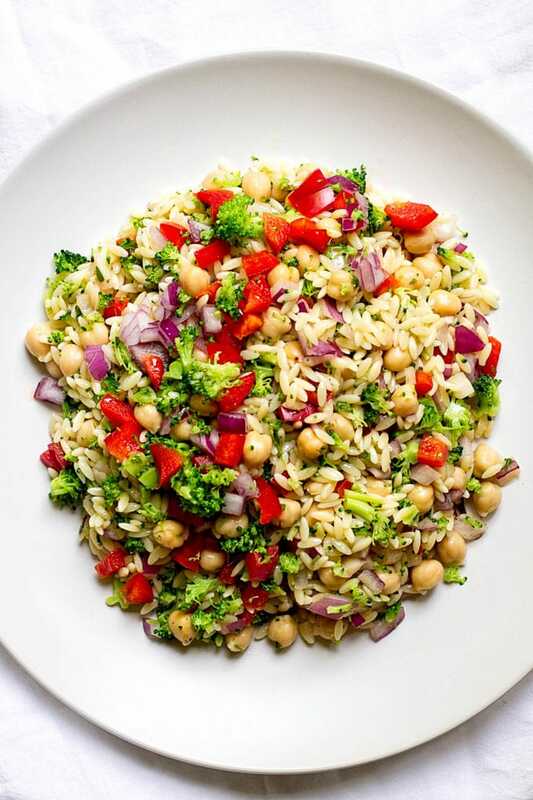 Inspired by the Greek Pasta Salad recipe in the cookbook Lose Weight by Eating by Audrey Johns, this light and refreshing salad is full of fresh broccoli, red bell pepper, red onion, and chickpeas. 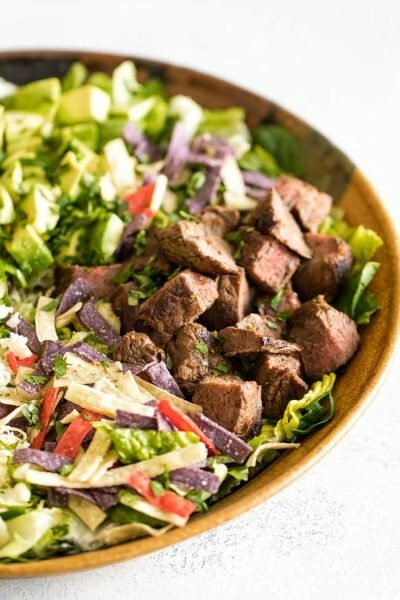 The salad is dressed up in a lemony dijon vinaigrette making it a great side dish for BBQs and potlucks. Place ice cubes and water in a medium-sized bowl. Bring a pot of water to a boil. Add the broccoli florets and let them boil for 2 minutes. Scoop them out of the water and submerge them in the bowl with the ice and water to stop them cooking. Drain them and set them aside. 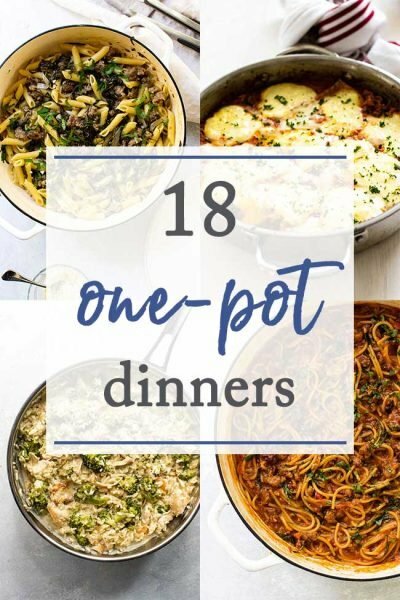 In the same pot that you used to blanche the broccoli, boil the orzo. There’s no need to change the water, just be sure and bring it back to a rolling boil and add 2 tablespoons of salt before adding the orzo. Cook the orzo according to package directions. While the orzo is boiling, chop the cooled broccoli florets into small pieces. In a large bowl, combine the lemon juice, mustard, balsamic vinegar, 1/2 teaspoon salt and pepper. While whisking, slowly add the olive oil. Whisk until the oil is fully incorporated. Drain the orzo and transfer it to the bowl with the dressing. Add the broccoli, bell pepper, red onion, chopped parsley, and chickpeas and toss well to combine. Loved it… but needed to add more mustard and vinegar for more flavor. Recipe is great! The dijon mustard is listed on the ingredients but not incorporated in the recipe. We whisked it in with the balsamic vinegar and lemon juice , then added the oil and it turned out great. (We preferred a little more mustard than listed). Nice light, quick, yummy summer side dish! Oh, thank you for pointing that out! Yes, the mustard is combined with the lemon and balsamic 🙂 So, glad you enjoyed it and thanks for sharing your adjustments!